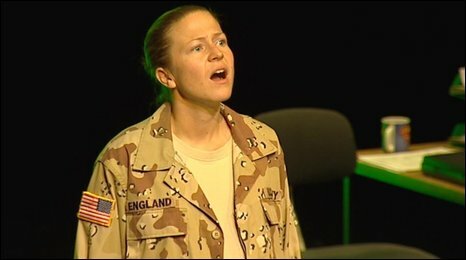 A play which looks at the war in Iraq from three different viewpoints has won the Amnesty International Freedom of Expression Award. Palace of the End by Judith Thompson was described by the human rights organisation as "a truly formidable piece of work". However, the play "never falls into the trap of being worthy or preachy". Palace of the End, written by Canadian playwright Judith Thompson, is a series of monologues from the perspective of three different people involved in the Iraq conflict. Two are based on real-life characters. Lynndie England, the American soldier who became the face of the Abu Ghraib scandal, and the UN weapons inspector David Kelly, whose discussion with BBC journalist Andrew Gilligan prompted a huge political scandal about weapons of mass destruction. Amnesty International Scotland director, John Watson, said: "The audience is drawn in towards understanding and even empathising with the three characters, each of them a world away from our daily experiences. "The power of the arts to engage people with human rights is precisely what we want to celebrate with this award. "To have such an excellent winner, chosen from a record number of entries, really underlines that the Fringe has lost none of its political bite." Palace of the End was chosen from a shortlist that included The Chronicles of Long Kesh, The Chronicles of Irania and Year of the Horse. A record 63 productions entered for the award this year. Last year's winner, Deep Cut, went on to be performed at the Tricycle Theatre in London.